Branding and Dracula are back in the headlines. This is a result of recent initiatives by the Minister of Tourism to boost travel by foreigners to Romania. In the Ministry’s judgment ‘Branding’ and ‘Dracula’ are priority targets for substantial funding. – 350,000 foreign leisure travelers per year of whom 90 per cent are from Europe. The Delta receives about only 10-12,000 foreign visitors per year – not many. The average time spent by a foreign visitor in Romania is 2.5 days. This is not very long. Assuming that a visitor spends $500 to $1000 per visit, the total value of 1,150,000 foreign visitors for business and leisure generates $575 to $1,150 million per year. The other 5 million are people who cross the border for day trips as merchants, truck drivers and cross-border traffic in local border areas such as Moldova to Romania. Branding is a corporate concept recently made fashionable by wealthier countries in the search for tourist dollars: Dubai, New Zealand, Ireland, Morocco and others. But successful branding – as practiced in the corporate world – is based on giving identity to a recognized product or service with a predictable and consistent quality. Branding success can be destroyed by a single error such as cases of food-poisoning, misrepresentation, or quality lapses. In this context Romania is not ready for branding. Why? One reason is that there are no consistent standards for quality or service in the tourism industry. A five-star hotel in Mamai may actually be a 2-3 star by international standards. A pension in Bran with 5 daisies may be less good than one with three daisies. 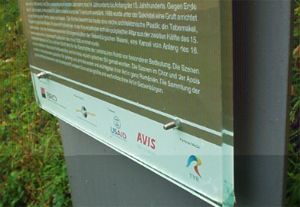 Symbols on a tourist map for “Information” or “Public Toilets” may turn out to be non-existent or unusable to a visitor. In many locations expensive US-AID touch-screen information kiosks don’t work. In Malencrav a costly metal panel with historic information covered by expensive thick glass was dismantled and the glass stolen (see photos). In short, the infrastructure is of patchy quality (though substantially improved over a ten year period). Such shortcomings create a ‘negative’ word-of-mouth backlash: “What they promoted is not what I got.” It is well known that negative word-of-mouth judgments are very difficult to overcome. One has to ask, therefore, what is the message of a ‘Branded Romania’? Dracula. It is a sad legacy of Communist-era promotion that Dracula became synonymous with Romania. That the Bran Castle was and is still falsely used to sell this image is demeaning. More recently, the ill-conceived Dracula Park in Sighisoara was created both to attract the low-end visitor market not to speak of suspected behind the scenes profiteering. As a person of Romania-origin, I find the fictitious novel and movie character to be an embarrassment especially when one sees the ways in which it is used to drive business: bloody imagery, vampires, and dark turreted castles. While the Dracula-theme may produce revenues for cheap travel tours, it does not elevate a foreigners image of Romania. In fact, it does just the opposite. It devalues the underlying purpose behind ‘branding’. The opportunity for tourism is enormous given the physical and cultural beauty of Romania. These are the identities to be promoted – as one finds indeed in leading guidebooks such as Guide Bleus Evasions, Lonely Planet, Insight, or Rough Guide. The use of existing tourist hotels, lodgings and services is a by-product of that attraction, ie the intended economic benefit. Copyright © D. Dimancescu, Cambridge, MA. 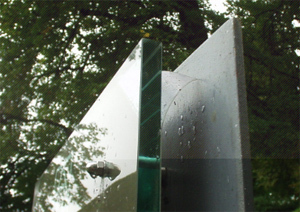 US-AID funded information panel installed in Malencrav (2006) with thick glass surface bolted onto metal back. TOP: Note missing bolt on lower right side of panel. BTTM: Note information sheet peeling off back of thick glass surface. 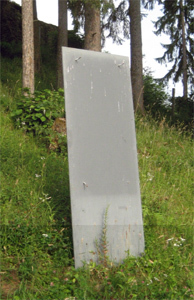 LEFT – All that is left (2007 is the metal backing looking like a gravestone.